Yeasted Waffles - Do You Know The Muffin Man? Notes: Batter has a strong smell from the yeast action. 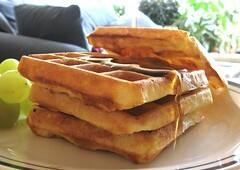 I might have overmixed the batter, as the waffles came out crisp, but a little chewy, instead of melt-in-your-mouth. This recipe produced 18 4" waffles. I've tried the Cook's Illustrated version he mentions in the article and recall liking it better.